A chemical element (pheromone) synthesized and released into the environmental by an insect, that affects the behavior or development of other members of the same species. 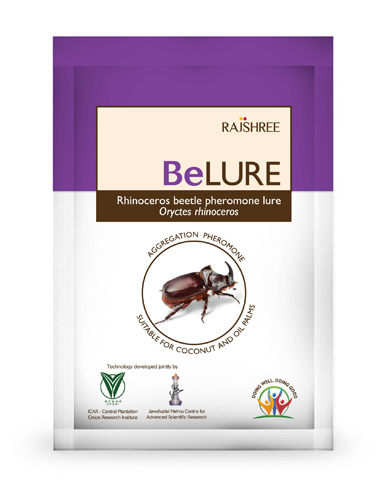 Rajshree Biosolutions (RBS) pheromones are aggregation pheromone and it has been established with help of the technology developed jointly by Central Plantation Crops Research Institute (CPCRI) and Jawaharlal Nehru Centre for Advance Scientific Research (JNCASR). It is an economically important tissue boring pest of coconut and palm trees in many part of world. They preferably attack to palms that are already affected or weaken by other stresses and also colonize on healthy palms. Larvae bore into the trunk of a palm and feeding by the larvae and adults inside the palm causes toppling of the palm. A chemical element (pheromone) synthesized and released into the environmental by an insect, that affects the behavior or development of other members of the same species. 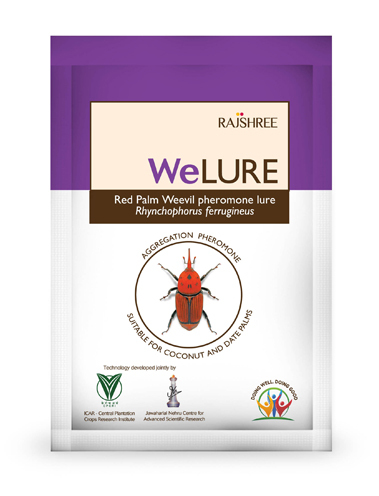 Rajshree Biosolutions (RBS) pheromones are an aggregation pheromone and it has been established with help of the technology developed jointly by Central Plantation Crops Research Institute (CPCRI) and Jawaharlal Nehru Centre for Advance Scientific Research (JNCASR). The black coloured beetle bores holes and feeds on the unopened and sapthe. Apart from that feeding damage they serve as predisposes for red weevil attack and bud rot. The damaged leaves show geometric cuts (V shaped) on leaf lets. It causes damages to seedlings, young and adult palms.